A waterproof substrate is fundamental to the success of tile and stone installations. This is easily achieved with Schlüter-Systems' range of tanking membranes and backerboards. 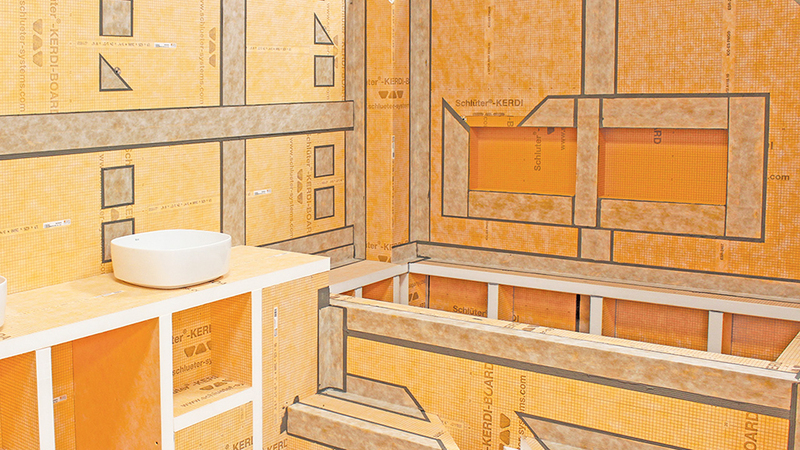 Whether you're looking for a waterproof overlay for plasterboard, or a ready-waterproofed tile backerboard, Schlüter-Systems has the solutions you require. Sheet-applied polyethylene membrane for waterproofing walls and floors in wetrooms, bathrooms and other applications. Sheet-applied polyethylene membrane for waterproofing walls and floors in steamrooms, saunas and other areas subject to constant moisture. Cement-free backerboard for tile and stone, in a variety of thicknesses. Create anything from a simple overlay onto existing substrate, to features such as shelves, partition walls and benches. Pre-grooved cement-free backerboard for tile and stone, in a variety of thicknesses. Use to easily create curved overlays and features. Schlüter-Systems offers a variety of prefabricated waterproof elements, to make light work of a number of bathroom and wetroom features. Take advantage of tileable shower niches for the creation of recessed shelving, ready-constructed pipe panelling and preformed corner pieces.